^ Japanese: 株式会社モノリスソフト, Hepburn: Kabushiki gaisha Monolith Soft? ^ a b c d e モノリスソフトとは / 株式会社モノリスソフト (in Japanese). Monolith Soft. Archived from the original on 27 September 2018. Retrieved 27 September 2018. ^ "Game software firms Enix, Square to merge on April 1". The Japan Times. 27 November 2002. Archived from the original on 13 July 2017. Retrieved 11 March 2017. ^ a b c d e Parkin, Simon (29 November 2015). "Takahashi's castle: An RPG master's journey from Final Fantasy to Xenoblade". Eurogamer. Archived from the original on 17 January 2016. Retrieved 11 July 2017. ^ a b c Yip, Spencer (4 June 2010). "Reflections With Soraya Saga Part 1". Siliconera. Archived from the original on 12 March 2016. Retrieved 15 August 2016. ^ a b Yip, Spencer (11 June 2010). "Soraya Saga On Xenogears And Xenosaga". Siliconera. Archived from the original on 22 December 2015. Retrieved 27 May 2011. ^ "Hironobu Sakaguchi/Chairman and CEO". Square USA. Archived from the original on 11 May 2000. Retrieved 19 April 2013. ^ a b c d ザ・プレ特別インタビュー (in Japanese). Monolith Soft. 20 December 1999. Archived from the original on 21 April 2001. Retrieved 21 January 2016. ^ a b Sato, Ike (8 November 2001). "Xenosaga Interview". GameSpot. Archived from the original on 5 December 2015. Retrieved 31 August 2008. ^ a b c Johansson, Martin (2002). "Xenosaga - The Power of Will". SUPER Play (in Swedish). SUPER Play (April 2002). ^ a b c d Sato (21 August 2017). "Monolith Soft Executive Producer On Going From Namco To Nintendo". Siliconera. Archived from the original on 21 August 2017. Retrieved 28 September 2017. ^ Ciolke, Todd (6 February 2013). "The X Button - Squared Circle". Anime News Network. Archived from the original on 9 February 2013. Retrieved 28 September 2017. ^ a b 会社情報 / 株式会社モノリスソフト (in Japanese). Monolith Soft. Archived from the original on 11 July 2011. Retrieved 28 September 2017. ^ Creator's Talk - Tetsuya Takahashi (in Japanese). Sony. 2002. Archived from the original on 5 February 2005. Retrieved 20 December 2015. ^ インタビュー『ゼノサーガ』 - 電撃オンライン (in Japanese). Dengeki Online. 2002. Archived from the original on 20 January 2016. Retrieved 20 January 2016. ^ a b "Xenosaga series loses key writer". GameSpot. 19 January 2005. Archived from the original on 29 November 2013. Retrieved 9 August 2017. ^ "Baten Kaitos Interview". IGN. 3 May 2004. Archived from the original on 7 May 2004. Retrieved 15 July 2010. ^ "Baten Kaitos: Eternal Wings and the Lost Ocean Interview (GC)". IGN. 21 October 2004. Archived from the original on 13 December 2004. Retrieved 15 July 2010. ^ a b c バテン・カイトス 終わらない翼と失われた海 公式設定資料集 [Baten Kaitos: Eternal Wings and the Lost Ocean Setting Data Collection]. Ohzora Publishing. 1 October 2004. ISBN 4-7767-9056-4. ^ a b c d e f 週刊ゼノサーガ. Weekly Xenosaga Episode II (in Japanese). SoftBank Creative (3): 6–12. 2004. ^ a b モノリスの新作3タイトル発表！『ゼノサーガエピソードII』では『I』の謎が明らかに！ (in Japanese). Dengeki Online. 21 July 2003. Archived from the original on 5 September 2017. Retrieved 12 September 2017. ^ a b Famitsu (in Japanese). Enterbrain (6 June 2003): 34–35. 23 May 2003. ^ a b "Iwata Asks: Xenoblade Chronicles for Wii - Vol 3: The Development Process". Nintendo UK. 2011. Archived from the original on 8 December 2015. Retrieved 8 December 2015. ^ a b ゼノサーガ エピソード2 [善悪の彼岸] 公式コンプリートガイド [Xenosaga Episode II: Jenseits von Gut und Böse Official Complete Guide]. Namco. 27 July 2004. pp. 358–363. ISBN 4-9023-7203-7. ^ a b c d トムクリエイト　開発履歴 (in Japanese). Tom Create. Archived from the original on 14 March 2007. Retrieved 10 August 2017. ^ Winkler, Chris (25 January 2005). "Namco x Capcom Press Conference Report". RPGFan. Archived from the original on 6 February 2005. Retrieved 28 September 2017. ^ "Namco and Capcom announce crossover RPG". GameSpot. 28 January 2005. Archived from the original on 1 December 2013. Retrieved 28 September 2017. ^ a b c d e f 開発実績 / 株式会社モノリスソフト (in Japanese). Monolith Soft. Archived from the original on 27 September 2017. Retrieved 28 September 2017. ^ Massimilla, Bethany (19 May 2005). "Dirge of Cerberus: Final Fantasy VII E3 2005 Interview". GameSpot. Archived from the original on 8 July 2017. Retrieved 20 July 2010. ^ a b ゼノサーガ エピソードI・II / 製品概要 / バンダイナムコゲームス公式サイト (in Japanese). Xenosaga I & II Website. Archived from the original on 30 July 2016. Retrieved 13 August 2017. ^ a b Winkler, Chris (1 December 2004). "Xenosaga, Baten Kaitos DS-Bound". RPGFan. Archived from the original on 5 May 2005. Retrieved 13 August 2017. ^ "Reader Q&A: Xenosaga Episode III". IGN. 10 August 2006. Archived from the original on 4 February 2016. Retrieved 22 January 2015. ^ a b c "Iwata Asks: Xenoblade Chronicles 3D for New Nintendo 3DS". Nintendo UK. 2015. Archived from the original on 21 November 2015. Retrieved 8 December 2015. ^ a b c Riley, Adam (8 March 2006). "C3 Exclusive Interview / Monolith Soft on Nintendo Wii Support, Baten Kaitos II & More". Cubed3. Archived from the original on 6 September 2006. Retrieved 28 September 2017. ^ Ike, Sato (24 September 2018). "Baten Kaitos 3 Was Canceled But Monolith Soft Art Director Wants It Back For A New Development". Siliconera. Archived from the original on 24 September 2018. Retrieved 27 September 2018. ^ Sobel, Jonathan (30 January 2017). "Masaya Nakamura, Whose Company Created Pac-Man, Dies at 91". New York Times. Archived from the original on 1 February 2017. Retrieved 30 January 2017. ^ Sinclair, Brandon (27 April 2007). "Nintendo buys Monolith Soft". GameSpot. Archived from the original on 22 June 2014. Retrieved 28 September 2017. ^ a b 会社情報 / 株式会社モノリスソフト (2011) (in Japanese). Monolith Soft. Archived from the original on 27 September 2011. Retrieved 28 September 2017. ^ "Financial Results Briefing for the 67th Fiscal Term Ended March 2007 - Q&A". Nintendo. March 2007. Archived from the original on 29 February 2008. Retrieved 28 September 2017. ^ Creator's Voice: 高橋 哲哉 x 光田 康典 (in Japanese). Nintendo. 2008. Archived from the original on 25 February 2008. Retrieved 15 August 2016. ^ a b バンプレストとモノリスソフトが生み出す新たなRPG！『無限のフロンティア スーパーロボット大戦OGサーガ』【映像インタビューつき】 (in Japanese). Famitsu. 11 January 2008. Archived from the original on 13 January 2008. Retrieved 28 September 2017. ^ N.O.M 2008年10月号 No.123：『DISASTER DAY OF CRISIS』開発スタッフインタビュー (in Japanese). Nintendo Official Magazine. 2008. Archived from the original on 2 October 2008. Retrieved 28 September 2017. ^ "Interview / Monolith & Nintendo Talk Disaster: Day of Crisis Wii". Cubed3. 27 November 2008. Archived from the original on 28 June 2017. Retrieved 28 September 2017. ^ DBが最新デジタル技術で復活！DS『ドラゴンボール改 サイヤ人来襲』プレイレポート (in Japanese). Inside Games. 13 May 2009. Archived from the original on 28 August 2009. Retrieved 28 September 2017. ^ a b Haywald, Justin (10 April 2015). "Xenoblade Chronicles X Will Have "Different Play Feel" Compared to First Xenoblade". GameSpot. Archived from the original on 7 September 2015. Retrieved 10 December 2015. ^ 【動画つき】新キャラクター＆序盤シナリオ紹介！『無限のフロンティアEXCEED スーパーロボット大戦OGサーガ』 (in Japanese). Famitsu. 10 February 2010. Archived from the original on 13 February 2010. Retrieved 24 September 2017. ^ ゼノサーガシリーズからM.O.M.O.が参戦！　「無限のフロンティアEXCEED」最新情報 (in Japanese). 4Gamer.net. 22 January 2010. Archived from the original on 5 October 2014. Retrieved 24 September 2017. ^ Romano, Sal (11 July 2011). 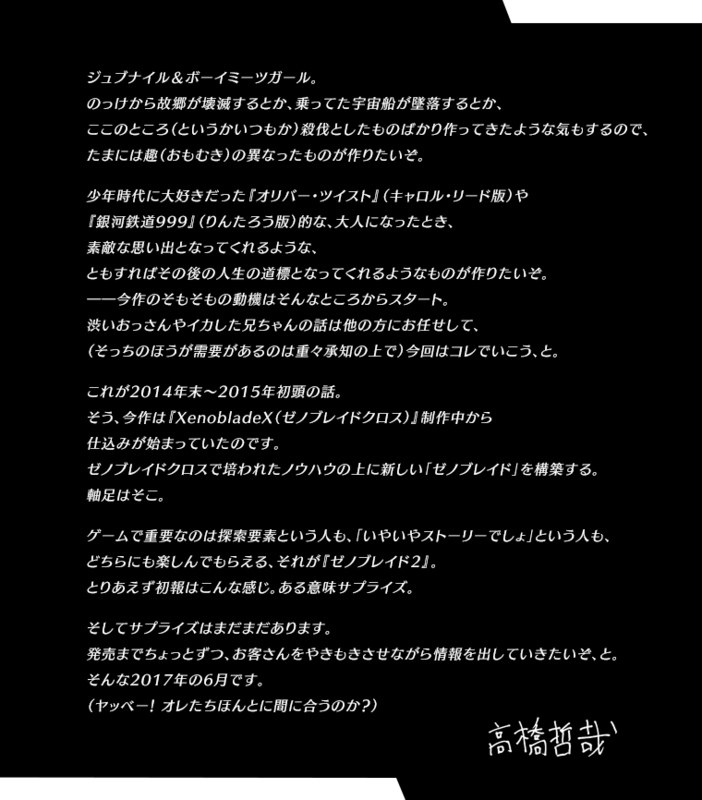 "Monolith Soft forms Kyoto studio". Gematsu. Archived from the original on 11 July 2011. Retrieved 28 September 2017. ^ a b Sato, Ike (8 February 2013). "Monolith Soft Discuss Their Closer Relationship With Nintendo". Siliconera. Archived from the original on 21 May 2013. Retrieved 28 September 2017. ^ Barnett, Patrick (22 May 2012). "Monolith Soft's Involvement in Skyward Sword Detailed". Nintendo World Report. Archived from the original on 13 March 2017. Retrieved 15 July 2016. ^ a b Hanson, Ben (24 June 2015). "Xenoblade's Director Talks Witcher 3, Zelda Wii U, And His Favorite RPGs". Game Informer. Archived from the original on 27 June 2015. Retrieved 11 July 2017. ^ Frank, Allegra (20 June 2016). "Nintendo's getting help from Monolith on Legend of Zelda: Breath of the Wild". Polygon. Archived from the original on 21 June 2016. Retrieved 28 September 2017. ^ 会社情報 / 株式会社モノリスソフト (2012) (in Japanese). Monolith Soft. Archived from the original on 2 January 2012. Retrieved 28 September 2017. ^ a b Schreier, Jason (21 January 2013). "That Crazy Sega/Namco/Capcom Crossover RPG Project X Zone Is Coming To America". Kotaku. Archived from the original on 23 January 2013. Retrieved 28 September 2017. ^ ゼノブレイドクロス ザ・シークレットファイル アート・オブ・ミラ [Xenoblade Cross: The Secret File - Art of Mira] (in Japanese). ASCII Media Works. 25 December 2015. ISBN 4-0486-5556-6. ^ a b Peckham, Matt (7 July 2017). "Why 'Xenoblade Chronicles 2' Has a Character Designed by Tetsuya Nomura". Time. Archived from the original on 7 July 2017. Retrieved 11 July 2017. ^ Takahashi, Tetsuya (2017). ゼノブレイド2 Message - 高橋 哲哉. Xenoblade 2 Website. Archived from the original on 15 June 2017. Retrieved 28 September 2017. ^ a b Takahashi, Tetsuya (21 June 2018). "Torna - The Golden Country Expansion Pass Content Detailed by Executive Director Takahashi". Nintendo. Archived from the original on 26 July 2018. Retrieved 31 July 2018. ^ Romano, Sal (20 August 2017). "Monolith Soft hiring for 'ambitious new project' different from its brand image". Gematsu. Archived from the original on 26 August 2017. Retrieved 28 September 2017. ^ Honne, Yasuyuki (6 June 2018). "今月から、弊社 飯田橋スタジオ 稼働開始しました( ^ω^ ) #モノリスソフト". Twitter. Archived from the original on 7 June 2018. Retrieved 7 June 2018. ^ モノリスソフトとは / 株式会社モノリスソフト (2017) (in Japanese). Monolith Soft. Archived from the original on 26 September 2017. Retrieved 26 December 2017. ^ Romano, Sal (4 October 2018). "Monolith Soft recruiting 1st Production development staff for new RPG project". Gematsu. Archived from the original on 17 January 2019. Retrieved 17 January 2019. ^ "新規RPGプロジェクト始動｜株式会社モノリスソフト". Monolith Soft. 4 October 2018. Archived from the original on 7 January 2019. Retrieved 31 March 2019. ^ Handrahan, Matthew (28 March 2019). "Monolith Soft is staffing for a new Legend of Zelda project". Gamesindustry.biz. Archived from the original on 1 April 2019. Retrieved 31 March 2019. ^ "ゼルダの伝説」シリーズ開発スタッフ大募集！｜採用情報｜株式会社モノリスソフト". Monolith Soft. 28 March 2019. Archived from the original on 29 March 2019. Retrieved 31 March 2019. ^ a b Sato, Ike (21 December 2012). "What Does It Take To Be Part Of Xenoblade Developer Monolith Soft?". Siliconera. Archived from the original on 3 June 2017. Retrieved 28 September 2017. ^ Sato, Ike (14 December 2012). "Xenoblade Developer, Monolith Soft, Want To Be Like Bethesda Softworks". Siliconera. Archived from the original on 16 December 2012. Retrieved 28 September 2017. ^ a b Sato, Ike (5 July 2013). "Monolith Soft's New Kyoto Studio Sounds Like A Great Place To Work". Siliconera. Archived from the original on 7 July 2013. Retrieved 28 September 2017.